Parcels & Properties within 24th Ward, Alder Michael Scott, Jr. The full view of parcels and property taxes within 24th Ward, Alder Michael Scott, Jr. are for Cityscape Pro and Cityscape Permits members only. 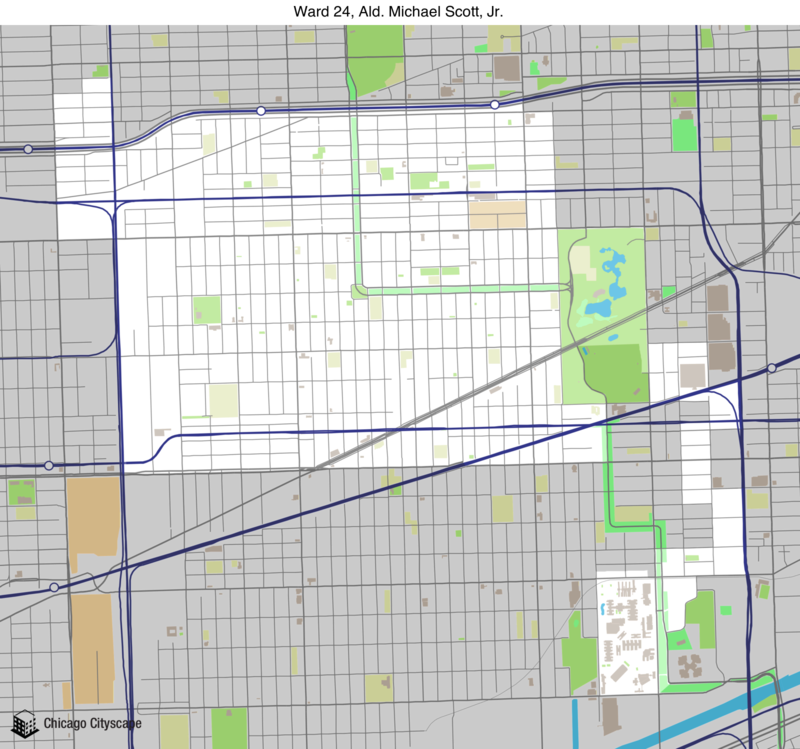 You're free to use our static map of 24th Ward, Alder Michael Scott, Jr., but please attribute Chicago Cityscape and link to this page. The area of 24th Ward, Alder Michael Scott, Jr. is 3.76 square miles. 2 people get notifications for 24th Ward, Alder Michael Scott, Jr.
Want to know what you're allowed to build in the 24th Ward, Alder Michael Scott, Jr.? Order a Zoning Report instantly from MAP Strategies. Track the likelihood of getting a zoning change approved in the 24th Ward, Alder Michael Scott, Jr.
Market info for 24th Ward, Alder Michael Scott, Jr.
Submarket 1 72.6% of 24th Ward, Alder Michael Scott, Jr.
Submarket 2 27.4% of 24th Ward, Alder Michael Scott, Jr.
Chicago Building Projects in the 24th Ward, Alder Michael Scott, Jr. Places overlapping or bordering 24th Ward, Alder Michael Scott, Jr.
Show a map of all the Places that overlap 24th Ward, Alder Michael Scott, Jr., including ZIP codes, Census tracts, legislative districts, and TIF districts (this may take awhile if 24th Ward, Alder Michael Scott, Jr. has a large area). Showing a sample of 311 reports in the 24th Ward, Alder Michael Scott, Jr.